All the events of human history have to be backlit by the reality of our faith that God does not abandon His people. An example of this truth is today’s memorial of Our Lady of the Rosary. This memorial was established by Pope St. Pius 5th in thanksgiving for the Catholic victory over the Muslim army and navy at the famous battle of Lepanto on October 7, 1571. Many rosaries were said by the European faithful during the battle to stem the tide of the Islamic invasion. The admiral for the Catholic Fleet, Andrea Doria, had the miraculous image of Our Lady of Guadalupe (seen below) in the stateroom of his flagship. Prior to the battle King Philip 2nd of Spain had given the Mexican icon of the Blessed Mother to Admiral Doria. Our Gospel today tells us that our Lord God chose Mary, a humble Hebrew teenager, to be the finest being within His creation. She was offered the opportunity to be the counterpoint to the sin and evil that consumed the world. She was offered the opportunity to be the Theotokos- – the Bearer of God – the Mother of the Messiah. It is God’s will to have beauty and purity, mercy and justice, exist along side the evil that Satan – with man’s complicity – brought into the world; and it is the Father’s will, through the actions of Jesus and His mother Mary, that they overcome and defeat the evil that Satan spawned. God is an artist. His palette consists of many different colors. He uses the darks as well as the lights to achieve His end. We too, are artists. Like Mary we have a choice. Mary chose to humbly accept the will of God for her life, even though she did not foresee and understand all that was to take place. She decided to paint the structure of her life – and the life of her family – with the colors of faith, humility, love, and joy. Did the masterpiece of her life include the darkness of suffering, pain, and loss; yes, of course it did, but those dark shadows did not muddy the joy and happiness she was to know in doing the will of God – it was not to interfere with her accomplishing her grace filled mission for the family of God. 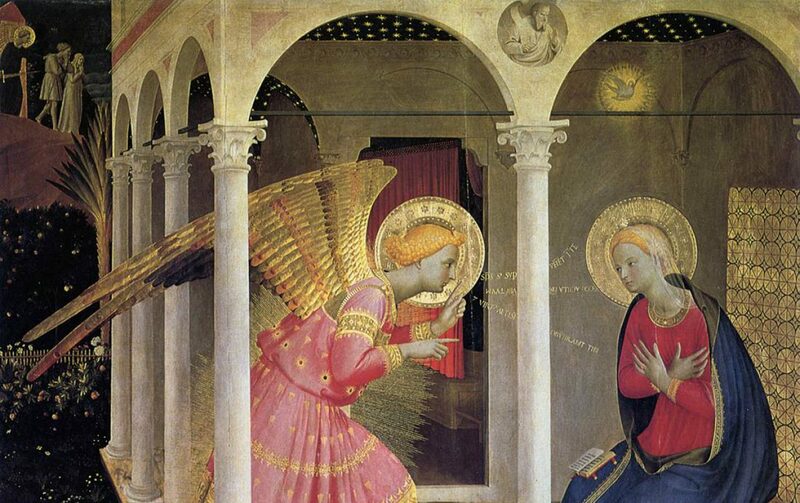 It is through the humble statement of Mary to the angel Gabriel, “Behold, I am the handmaid of the Lord. May it be done to me according to your word,” that our salvation was made possible. It is through Mary’s “Yes” that the Holy Spirit, in an intimate and personal encounter with her, was able to accomplish the pledge made to King David that “the time of the fulfillment of God’s promises and preparations [will begin].” (CCC # 484). As Catholic Christians we understand that the prayer that we call the Holy Rosary was given to St. Domenic (Domingo de Guzman) in 1208 by the Blessed Mother. If prayed with reverence and attention, the Holy Rosary through the recitation of the four great Mysteries: Joyful, Luminous, Sorrowful, and Glorious, recount the entire life of our Lord and His ministry to us. Mary gave this prayer to St. Domenic so that it might become a vehicle for meditation and contemplation on all that her Son did for us. It is not meant to be a tool of mindless recitation. To say that would be as callous as saying that Michelangelo used his sculptor’s tools to just break marble. Mary understood – and understands – that we need a process in which we can reflect on the saving actions of her Son, while at the same time, intoning – either privately in silence or audibly in a group – the beautiful prayer of the angel Gabriel at her Annunciation, the prayer that Jesus Himself taught us, and the famous doxology of the Glory be. Faith, humility, love, and joy – these virtues will help us become better sacred artists – and better people, and the Holy Rosary is an important tool to help us achieve our goal. The painting below is by Fra Angelico and shows St. Dominic, the Blessed Mother, and St. John the Evangelist. Fra Angelico inserted St. Dominic into the scene in an attempt to suggest to his fellow friars that Dominic’s prayer was so mystical and so intimate that he united himself to the Cross of Christ – and that he embraced the Cross in faith, humility, love, and joy. It is a worthy suggestion for us to contemplate, too.